In 2007, the Coast Transit Authority in Biloxi started up a bus route called the 'Casino Hopper'. 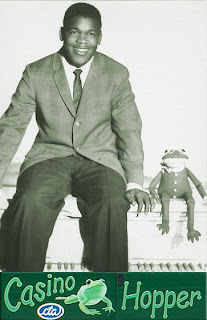 Painting the buses with a bright green logo of a frog, they then hired Clarence 'Frogman' Henry to help them publicize the new service, in both television and radio advertisements. The campaign captured Sir Lattimore Brown's imagination and, if he told me about it once, he told me about it a thousand times; "Here's a guy ain't had but that one hit record - a guy I used to work with back in the day, and here he is fifty years later on the side of every bus, and on the TV every time you turn it on, with that little frog next to him, and the frog says 'Ribbit! I finally found a home!' It just goes to show you that anything can happen!" The fact remained, however, that Lattimore didn't have a home. Not really. Not since Katrina had come and blown his life away. As you may recall, he had lived for a while in a FEMA trailer but, after they towed those away in the wake of that whole formaldehyde thing, they moved him to a motel. 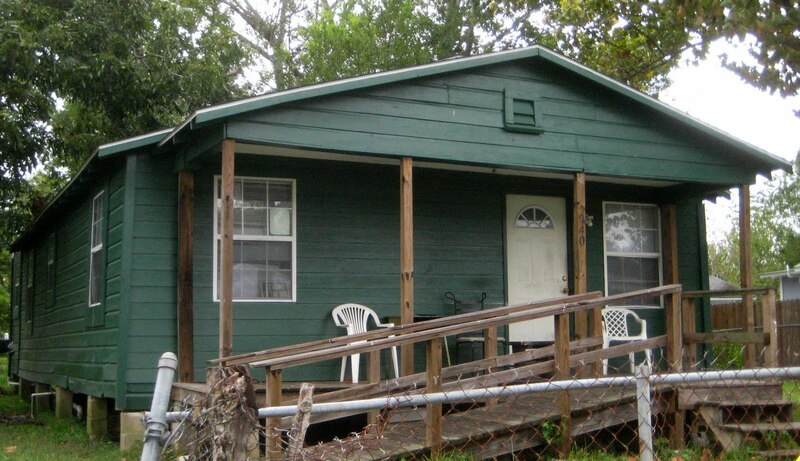 Once the government stopped footing the bill in late 2008, he moved into a run-down boarding house back in his old neighborhood of East Biloxi, which is where he was living when we picked him up in April of 2009 to bring him to New Orleans. It was a trip that would change both of our lives, and gain Lattimore some of the recognition he so richly deserved. Before it was over, he would be interviewed on WWOZ, perform at The House of Blues, and get his picture in the New York Times! Not bad at all... he surely must have felt like he was well on his way to his own endorsement deal, and having his picture on the side of a bus somewhere. He started calling me his manager, no matter how many times I told him I wasn't. He would call me up and ask about his next gig... and I honestly tried to make things happen. Just like he always told me, however, I found out that this is one tough business. Possible performances in Chicago, Brooklyn and Mississippi fell through for one reason or another that Summer and, to be honest, I felt like I was somehow letting him down. Sir Lattimore was still eating at the Loaves & Fishes Soup Kitchen, where his new found popularity had made him a bit of a celebrity. When they were in danger of being shut down in July of 2009, he went to bat for them on local television, and convinced me to run a fund drive here on the site. One night that August, he came home to find himself locked out of his room at the boarding house, and his meager possessions (including his trademark green straw hat) thrown out in the rain. He had been evicted without notice, and warned at gunpoint to never return. I never really learned the full story behind all of that, but suffice it to say that things were not good. 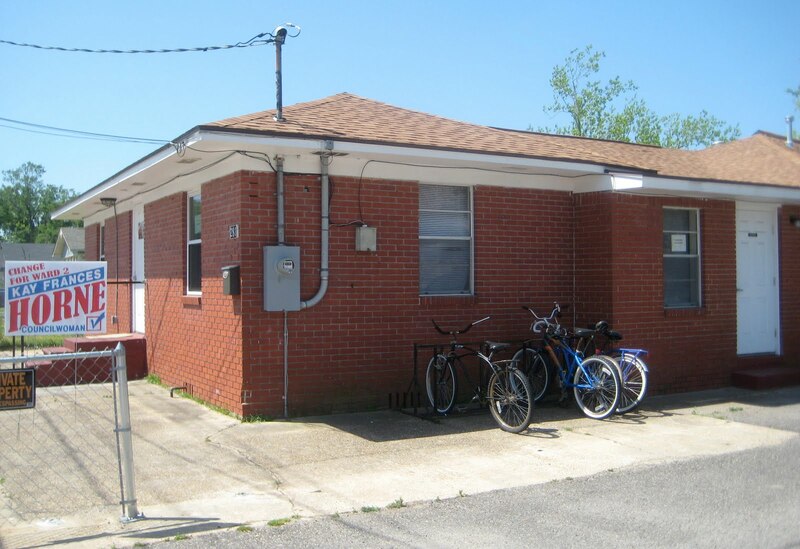 Lattimore was out on the street, and the best Social Services could do was place him on a waiting list for Section 8 affordable housing - along with hundreds of other people that were displaced by Katrina and left with no resources once FEMA pulled out. I knew I had to do something, but I had no idea what it was. 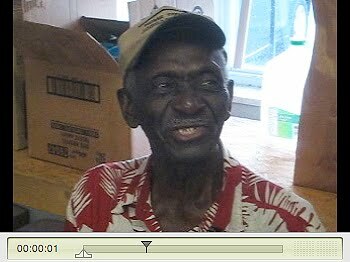 By September, Lattimore was renting a room with no electricity, heat or hot water in what can only be described as a 'shack' in East Biloxi. He could hardly meet even his most basic needs, let alone charge his cell phone. It became increasingly difficult to get a hold of him, and I felt like I was about to lose him again. It was time for a road trip. I had just started up The Red Kelly Channel thing on YouTube that summer, and I had this idea of kind of broadcasting live from the road as the miles rolled along, rather than writing about it here on the site. Although this seemed like a good concept, I don't think more than a handful of people watched the live updates back then. Even now, almost two years later, they have less than like 200 'views', which is fine, really... but I'd like to try and talk a little bit about what I was trying to accomplish. I had a couple of things on the Soul Detective back burner for a while, and when my pal Nathan Williams invited me to hang out with the Zydeco Cha-Chas and ol' El-Sido at the Rounder Records Fortieth Anniversary concert at The Grand Ol' Opry that October, I knew I had to go. I formulated a plan to fly into Nashville, rent a car, go get Lattimore and bring him back with me to Music City, in hopes that he would decide to stay. I got an early flight, and poked around a little in what's left of the Jefferson Street neighborhood where Lattimore used to hang out until I found someone who knew where Marion James lived. Marion, known locally as the 'Queen of the Blues', had married Lattimore's best friend, Jimmy 'Buzzard' Stewart in the mid-sixties, and continues the tradition of his 'open-door' policy with her Musician's Aid Society to this day. When I told her what I had in mind, she was all for it, and promised to make some phone calls and try to round up as many of the old gang as she could to welcome Sir Lattimore back. The Rounder show, which was filmed for an upcoming PBS Presents episode, was great, and it was very cool indeed for someone like me to have been invited backstage at The Opry. The Cha-Chas stole the show, man! The next morning, I was up early, and went searching for the site of Woodland Studio, where so many great Nashboro and Excello records were cut. Although it houses something else now, it was good to see that the building is still standing. As I drove through Atlanta later in the day, I called Sister Lucille Pope and spoke with her about the timeless music she created there with Shannon Williams. God Bless that woman! I made it as far as Augusta that first night, and after paying my respects at the Godfather statue downtown, and seeking out his legendary digs the next morning, I set out for a rainy drive through South Carolina on my way to meet with Benny Gordon's wonderful family in Allendale. They in turn directed me to one of Benny's southern 'Soul Brothers', V.C. Sanders, who was kind enough to speak with me about their days with Trudi Heller in Palm Beach, where they would become 'Nobody's Children'. After stopping in to visit Roy C, I was on my way, making it as far as Dothan, Alabama. Biloxi, at that point, was only about 250 miles away, but I had one more stop to make. Shortly after I first wrote about Benny Spellman in 2006, I learned that he was confined to a nursing Home in his hometown of Pensacola, Florida. 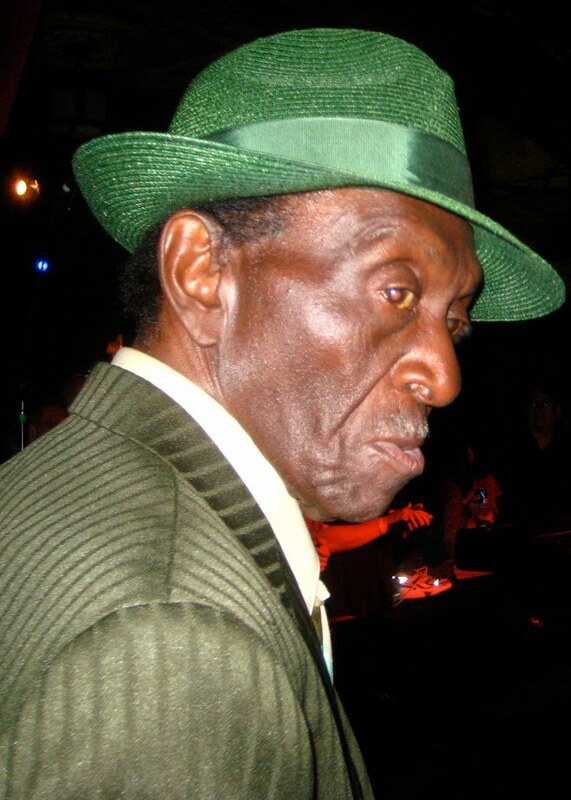 He is, quite simply, one of the last remaining cornerstones of New Orleans R&B, and one of my all-time favorite singers. I resolved then and there that if I ever got the chance, I would visit him, and I did. It was an incredibly deep and humbling experience that I will never forget. We love you, Benny! After a post I put up about James & Bobby Purify in 2007, Papa Don Schroeder left me a comment; "This is the most accurate account of how 'I remember it all'. I don't need to write my memoirs...you did it for me! If you ever come to Pensacola, Florida, Mama Gail and I would love to have you as a guest in our home..." Hey, you don't have to ask me twice - I took him up on the offer, and after we did lunch (and he insisted on picking up the check), Papa Don showed me around his town a bit, and played me some of the amazing Gospel music he had just finished producing in Nashville. It was a great visit, and one that seems now like it was meant to be. I arrived in Biloxi as the sun was going down, and found Lattimore at The Loaves & Fishes. He was in rough shape, babbling on without making much sense, and rather obviously in the midst of an extended bender. Within about ten minutes, he asked to borrow twenty five bucks, and disappeared for over an hour. I was not impressed. What the hell had I gotten myself into? Once he finally did come sauntering back (even more wobbly than before), I told him I'd be back to pick him up early in the morning. The very nature of the tracks we put up here is that they are obscure, and are transferred from my original scratched-up vinyl records to the computer. They may never be re-issued on a CD. If they are, you should buy them... they'll sure sound a whole lot better! Copyright © 2005, 2006, 2007, 2008, 2009, 2010, 2011, 2012, 2013, 2014, 2015, 2016 by red kelly. all rights reserved. like that.